This past weekend I surprised myself by spending a bit of quality time with a game I hadn't played in years: Ice Climber. I didn't own this Kenji Miki-designed game as a youngster, but I definitely rented it once or twice. Unfortunately, I can't remember whether I liked it or not. If I had to guess, though, I'd say I was a bit torn about it. After all, I obviously liked it enough to rent it a few times but not enough to actually buy it. Well, that still pretty much sums up how I feel about Ice Climber after playing it again a few days ago. On the one hand, there's a lot to love about this antique platformer, what with its bright and charming graphics and jazzy soundtrack. On the other, there's plenty to hate about it, too--like its horrendous, Mario Bros.-esque jumping mechanism. Unfortunately, said mechanism all but kills my ability to enjoy the game. I say "all but" because, despite the fact that the above-mentioned shortcoming causes me to swear like a sailor every time I play the game, I keep going back to it like a moth to a flame. The question is: Is my undeterred interest in the game due to its redeeming-despite-its-difficulty qualities or is it, quite simply, due to the fact that I'm a masochist? If I knew what a Masochist was.. But, I'll agree about the jumping mechanism. It's the same reason why I can't really play Castlevania games, it has the same kinda' jumping. Though the physics make more sense. The Super Mario Bros. esque way of changing direction whilst in the middle of a jump 'aint really possible in real life. It's odd though. I would've thought an Ice Climber remake would've suited the whole vertically-aligned-dual-screens feature of the DS nicely. You're a masochist. For sure. The jumping makes me want to hurt things...cute things...little things. And SUIKA, the Castlevania jumping scheme was MILES AND YEARS ahead of this junk. For sure! Oh, and your idea of making an Ice Climber game for the DS is a great one -- as long as the developers fix the damn jumping mechanism, of course! Justin: Oh, I'm glad I'm not the only one who thinks this aspect of Ice Climber is crap. It's too bad, though, isn't it? I mean, the game is so cute and charming otherwise. Also, most of Nintendo's other games from the same era (save for Urban Champion) are pretty darn good. I have the same awkward relationship with my copy of Ice Climber. I never played it when I was a kid. 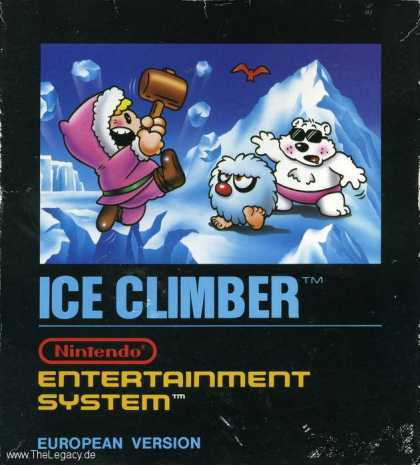 But when I got my first Famicom a couple years ago a lot of people (well, 2 people to be exact) told me to get Ice Climber because it was their favorite when they were kids. So I had it in my mind "Ice Climmber is a good game. I must like it." And pop it in a play it. Once. Then back on the shelf with it. Your first playthrough of Ice Climber must have been interesting, Sean, if all you'd heard of it until then was positive reviews! I agree with you, though, when you say that there's still some appeal to the game despite the horrible jumping mechanism. Like you said, the appeal isn't great enough to draw you back often -- or for long -- but it's definitely there. Well, for some of us, at least. What I find strangest about my mild dislike for the game is that most of Nintendo's other Famicom/NES games of the time were pretty darn good -- Balloon Fight, Wrecking Crew, etc. Well, you're definitely right that the game wouldn't be the same if they had altered/improved the jumping/mechanism, Starfighter. I'm guessing it would have made it easier, although I'm not sure how much easier it would have made it, to tell you the truth. It certainly would make it more enjoyable, though -- at least for me.